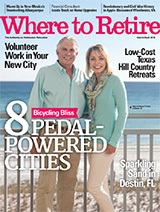 AARP The Magazine toured the nation to find the top 10 retirement destinations that offer a fabulous lifestyle without outrageous costs. To determine the list, AARP The Magazine examined financial data on more than 350 cities across the country including the median housing price, cost of living, tax rates on pensions and Social Security, recreation, climate, and health resources. The magazine describes Winchester as “a peaceful hamlet near the nation’s capital” and highlights the area’s Civil War history, rural location with apple and peach orchards, and shady brick historic district. Kiplinger’s Personal Finance describes Winchester as a city that appeals to retirees who love its small-town Southern charm and big-city amenities. Are you planning to relocate to the Winchester-Frederick County area? Stop by the Visitors Center while you are in Winchester and pick up one of our relocation packets. The packet includes helpful local information and an optional area map. If you are relocating to the City of Winchester, you may also visit their website for the New Resident Guide online. For future Frederick County residents, learn more about Living in Frederick County.